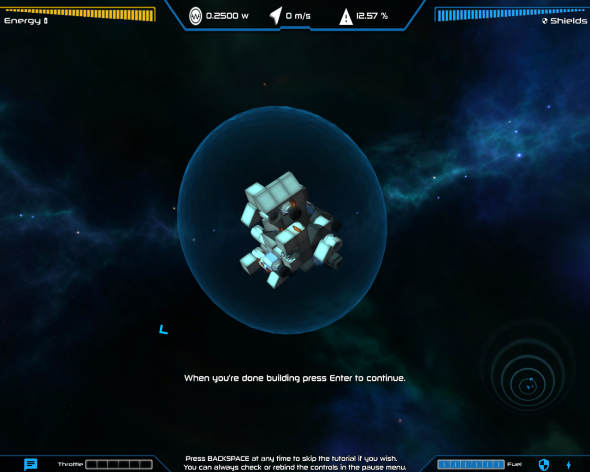 With the upcoming space sandbox game Lightspeed Frontier, developer Crowdwork Studios and publisher Riveted Games want to bring you a game which allows you to really take control and fine-tune every aspect of your spaceship. They take modifications to the extreme as you can literally build your ship block by block, deciding yourself what is needed for the mission ahead. We had the opportunity to try the pre-release version and experienced first-hand you don’t become a spaceship engineer in a day. 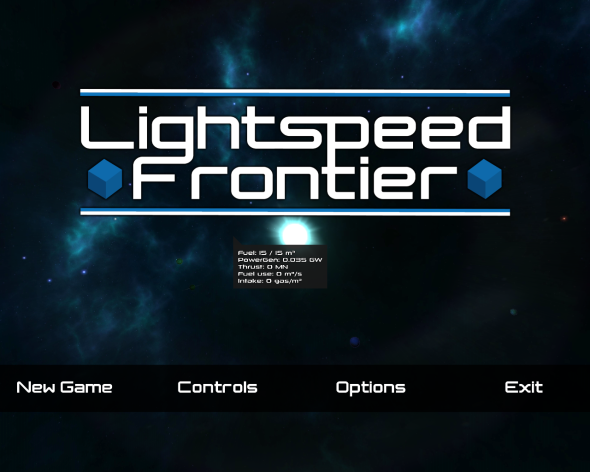 Lightspeed Frontier is another in a growing line of sandbox games. This means that the world, or in this case, the universe you explore, is virtually limitless. On top of that, when you start a new game, the complete universe is generated giving you a unique experience each time you restart. The first time you enter the game it is not a luxury to follow the tutorial as the different aspects of the game can take some time to grasp. We accidentally dropped out of the tutorial before learning how you can actually pick up some missions leaving us lost in space and eventually restarting the tutorial to find out. As you just started out your captaining lifestyle you do not have a lot to start with. With a limited amount of credits in your bank account and a basic ship, you set out into the great unknown. Luckily warp technology has already emerged and you are able to jump quickly between galaxies. Unfortunately you are not the only one capable of interstellar travel and you will often encounter scavengers with less than honorable intentions. With your weapons you will need to fight them off and upon destroying them you can even scavenge some of their ship parts. When you are near a space station you are safe from these space pirates but be careful that you don’t get hustled by those other kinds of pirates: the corporations exploiting the space stations. You might even ‘recognize’ some of the brands that seem to have stood the test of time. At the space station you are able to get quests and buy some fuel or parts for your ship. 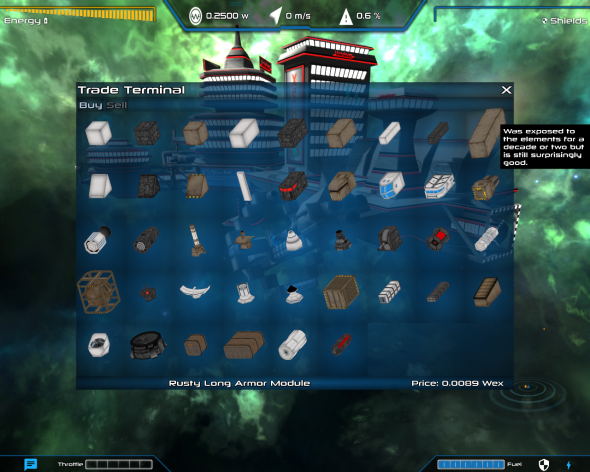 If you are happy with a particular kind of ship configuration you can store it for later reuse. When the inevitable happens and your ship is destroyed you can always restore your previous layout at a space station, provided you have enough credits of course. If the ship-building aspect doesn’t appeal to you, you can also just upgrade your ship to one of the many predefined schematics. Unfortunately other than the name there is not a lot more to go on besides that more expensive probably means better. When engaging the enemy you have a couple of weapons to choose from. The place where they are mounted on your ship determines also when and how you will have to use them during combat. To utilize side-mounted weapons you have to switch to a side-view where steering the ship all of a sudden becomes a whole lot harder. Presumably this mode is for juggernaut-class ships heavily outfitted with armor where maneuvering speed becomes quite slow but we haven’t had the luck (or credits) to experience this first-hand yet. 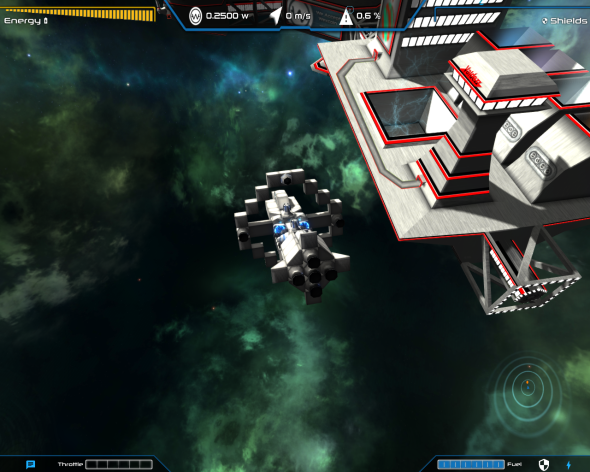 As ships (including your own) get shot, pieces break of which can be recuperated and attached to your modular ship. Central to the modular ship are the command modules. The more command modules you have, the higher the chance that after a negative outcome of a fight, you will have at least one ship that survived the mayhem and you can try and rebuild your ship from the lost parts. It however takes quite some skill and patience to build a proper ship from scratch, as you might see in the screenshot from one of our first attempts. There are other ways than engaging enemy ships to get rich though. By following the headlines at the space stations and exploring different galaxies you can find multiple ways to become the kingpin, for example by mining and selling resources. You can even invest in an in-game stock exchange of the different corporations! While testing the pre-release we didn’t encounter any notable bugs and the current list of known issues is also very short which bodes well for the future release. However, we did feel that due to the lack of nice background music there was a bit of atmosphere missing (pun intended). Sure during a dog-fight all of a sudden a pumping soundtrack appears out of nowhere but other than that and the sound-effects of firing lasers and missiles, the sound department is something that could use some love. It doesn’t seem to be on the developers’ to do list yet though, which mostly seems to be focused on tweaking the gameplay and UI changes. Taking into account the promised upcoming changes this seems quite a solid title, especially if you are keen on building and tweaking your spaceships. If, however, the idea of playing with blocks in space scares or bores you, this might not be the title for you.